A native prairie grass and wildflower sale will be held this weekend at the Living Prairie Museum. Beginning today until Sunday, the Prairie Flora Nursery will show the public how to incorporate native prairie plants into their landscaping. Plants such as the big bluestem, milkweed for monarch butterflies, and the rare Culver’s-root will be available for purchase. The sale runs from 3 p.m. to 6 p.m. today at 2795 Ness Avenue, and then from 10 a.m. to 4 p.m. Saturday and Sunday. Further details are available at PrairieFlora.com. The Living Prairie Museum is holding spring break day camps next week to occupy the minds of young ones off from school. Kids will be offered nature exploration activities, and the chance to become detectives to investigate local flora and fauna to find out whether or not spring has sprung. Camps will also include games, crafts and presentations. Light snacks are included but children should bring a bag lunch and drink. Day camps will run Monday March 28 to Thursday, March 31 from 9 a.m. to 4 p.m.
For more information and to register, call (204) 832-0167. 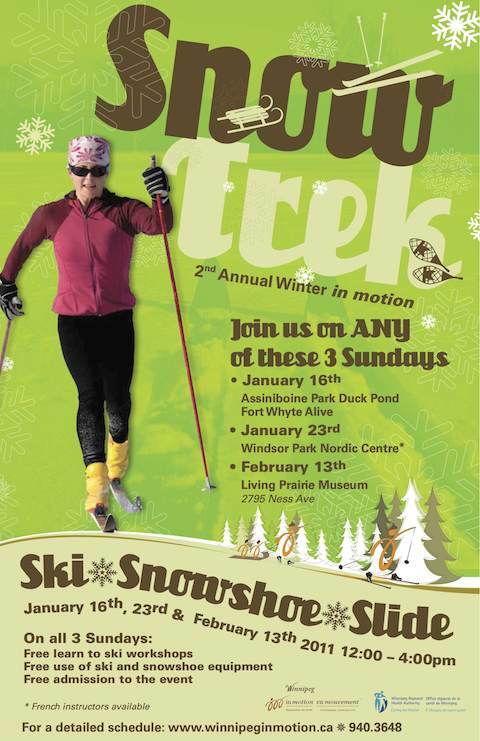 There’s one more Sunday left this winter to take part in Snow Trek, the second annual Winter in Motion. The fun-filled afternoon on February 13 is meant for the entire family to enjoy the outdoors by cross-country skiing, snowshoeing, tobogganing and winter walking. Free cross-country ski and snowshoe lessons will be given to beginners, and equipment will be supplied. Snow Trek runs from 12 p.m. to 4 p.m. at Living Prairie Museum, 2795 Ness Avenue. Organizers are also looking for volunteers to help them this weekend. If you’re interested, send an e-mail to Deanna at dbetteridge@wrha.mb.ca. Winter enthusiasts now have another trail to enjoy free cross-country skiing in the city. The tall grass prairie at the Living Prairie Museum will be groomed each Friday, making it an ideal location for skiers to enjoy the endangered ecosystem, while getting exercise at the same time. The St. James-area trail can be accessed from the southeast corner of the museum parking lot at 2795 Ness Avenue. The 1.4 km trail will be open daily from dawn until dusk. Families looking for something to do on Sunday won’t find a shortage of activities at the Living Prairie Museum. The museum at 2795 Ness Avenue is holding its 17th Annual Spirit of the Prairie Celebration with live music, square dancing demonstrations, a Red River Cart, sash weaving and prizes. 12 p.m. to 4 p.m. — All-day activities include: sash weaving, demonstrations by the Manitoba Archaeology Society and the Manitoba Living History Society, traditional games, bannock baking, crafts and face painting. Those wanting to volunteer can call the Living Prairie Museum at 832-0167. Volunteers are still needed as the Living Prairie Museum hosts the 3rd Annual Monarch Butterfly Festival on Sunday. A guided prairie hike will kick things off at noon with a naturalist taking visitors on a stroll to show them why Living Prairie Museum is the perfect place for many butterflies. 12:15 p.m. — Storytelling — Joe McLellan will be reading from his latest children’s story “Nanabosho and the Butterfly”. 1:00 p.m. — Meet a Butterfly Scientist — Join university butterfly research student Jaimee Dupont as she shares her findings from the field. 1:15 p.m. — Second Guided Prairie Hike — Take a stroll with a naturalist and learn why Living Prairie Museum is the perfect place for many butterflies. 2:00 p.m. — “Interpreting the Language of Butterfly Wing Colours” — Join Dr. Jeffrey Marcus for a discussion on the unique and colourful patterns of butterflies. Storytelling — Joe McLellan will be reading from his latest children’s story “Nanabosho and the Butterfly”. 3:00 p.m. — Butterfly Gardening Workshop — Learn how to create your own butterfly garden using native prairie plants. John Morgan of Prairie Habitats teaches you the tips and tricks to create a backyard butterfly oasis. Butterfly Boulevard Planting Party — Calling all kids! Roll up your sleeves and get your hands dirty by helping us plant a butterfly garden on the boulevard! 3:45 p.m. — Butterfly release and Closing Ceremonies — Door prize and colouring contest winners will be announced. All-day activities include life-cycle displays, crafts, face-painting and activities for all ages. The Monarch Butterfly Festival runs until 4 p.m. at 2795 Ness Avenue. Admission to the event is free, but donations will be gladly accepted. For more information or to volunteer, call the museum at 832-0167. The Living Prairie Museum will begin hosting Native Prairie Planting Workshops today. John Morgan of Prairie Habitats will lead the workshops and is a veteran of prairie planting and restoration. Participants will learn everything they need to know about having native prairie plants in their home or landscape design. A discussion, presentation and wildflower seed-planting demonstration will also be included. Thursday, April 29th, 6:30 p.m. – 9:30 p.m.
Tuesday, May 4th, 6:30 p.m. – 9:30 p.m.
Saturday, May 15th, 9:30 a.m. – 12:30 p.m.
Wednesday, May 26th, 6:30 p.m. – 9:30 p.m. Registration is $35 for museum members, and $40 for non-members. To register call 832-0167. Living Prairie Museum is located at 2795 Ness Avenue.